Another storyline featuring the Red Planet Mars. Another First Person shooter. 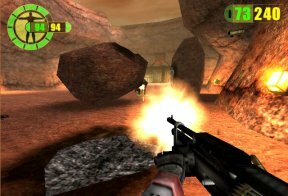 Red Faction is a must have game in your PS2 collection! You are the enigmatic Parker, a drifter that finds himself spending a year in the Mines on Mars working for the Ultor Corporation. He finds, instead of tranquility, a place of fear and oppression - a daily struggle for the miners on Mars. And a deadly mysterious plague is wiping out the miners. 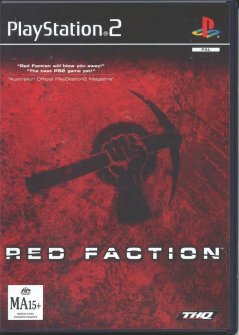 A group called the Red Faction takes action and Parker finds himself drafted into battle. The graphics on this title are fantastic and for a first person shooter the controls are very easy to master. Weapons are varied and all have a secondary fire to make them more interesting. The outstanding part of this game is the Geo Mod, the ability to destroy the landscape and surroundings with your heavy weaponry. Trapped in a corridor? Easy! Blow a hole in the wall and escape or provide yourself with some cover. Also glass finally breaks convincingly when shot or hit and shards remain on the ground. There are not many faults to this game other than I would have preferred to have some more background info on our main character Parker and the leader of Red Faction, Eos. You have the ability to drive and control a number of vehicles and heavy weaponry and the beauty of it is that you don't have to learn a new control mechanism for every machine. They all drive the same. I was highly impressed how vehicles respond to holes in the road, even almost overturning my jeep at one point. Red Faction is a must play for the multiplayer as well. Hours of fun can be had shooting your mates over and over again. Or you can just blow holes in walls. Secrets abound behind walls so don't be afraid to launch a few rockets into them. These are mainly behind posters and graffiti. Get this game and enjoy some damn fine entertainment.